Bold360 is the ultimate customer engagement solution delivering personalized interactions and the fastest time-to-value. 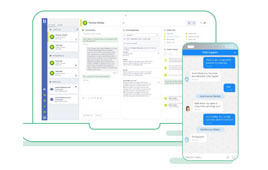 Leveraging the power of AI, Bold360 enhances every engagement– no matter the problem, channel or device– seamlessly across both AI and agent interactions. With groundbreaking intelligence and out-of-the-box simplicity, our powerful solution helps companies engage with visitors throughout the entire customer journey, from customer acquisition through conversion and into post-sale support. Download the Overview Brochure to learn why our customers choose Bold360 for customer engagement.